The Mercer Culinary Hell's Tools high temperature spootensil's unique shape makes it ideal for a variety of uses in any kitchen. 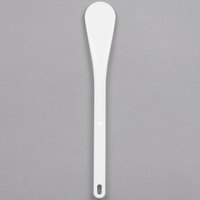 Use this white, 11 7/8" spootensil to mix, stir, or spread anything from sauces to batters! Made from specially formulated, glass-reinforced nylon, this spootensil is incredibly durable, stain and odor resistant and is also heat resistant up to 430 degrees Fahrenheit. Its one-piece construction makes it one of the most sanitary utensils available, and its indented handle provides a secure grip. Plus, the convenient hanging hole allows for quick access in the kitchen and easy storage! As a stirred, they are perfect. As a spoon, they are lacking (no bowl to scoop material) but I knew that going in. Biggest dock in stars is that they discolor - tomatoes, curries, etc. leave their mark. The thick plastic construction on these allows for you to get leverage when mixing thicker sauces up without having and issues with bending or breaking. The high temperature capabilities also allow for easy use without having to worry. Is holding up great so far. The spoontensils have become one of our more used stirrers in the kitchen for sauces and the like. All sizes are great to have, for almost nay application. I love this spoon! I use it to stir anything that is a thick consistency where I don't want a flexible spatula and need the strength of a sturdy one like this. I am not worried about breakage like I am with other plastic spatulas. I don't see this breaking or ever needing replaced. Spootensil might be my new favorite word! This handy little tool is versatile and can handle high temperature cooking jobs. It's lightweight and looks great. The best tool in my kitchen for stirring in pots or bowls. Bought these in all sizes. And will give these as stocking stuffers at Christmas. bought this as an addition to my high temp cooking utensils and ill be honest, i wasn't sure what to expect from this.. its a strange little tool. but oh my, i use this probably more than anything. its great for SO many things. if i don't have to actually scoop, i use this. a++ bought some for all the woman in my family too. I will say, this size is a bit short in my personal opinion, so i will definitely be ordering the larger sizes, BUT still great.. This is used to stir veggies and rice at a high temperature and it holds up well and is easy to keep clean. Great quality for the price. I use the Mercer Culinary Hell’s Tools eleven and seven-eighth’s inch white High Temperature Spootensil on a regular basis. I always appreciate not having to worry if I left the spoon in a pan. Works well, great solid construction, not too heavy and easy to order. I would order again for certain. The Mercer high temperature spoontensil is a must have for every kitchen. It is small but sturdy. You can use this for cooking almost anything in your kitchen. I purchased the Mercer M35121 Hell's Tools 11 7/8" White High Temperature Spootensil (Item #: 470M35121 MFR #: M35121) to use in culinary school. The "spootensil" is excellent! After multiple uses in a high-heat commercial kitchen it has never stained, is easy to wash, and I use it from sautéing on the stove to stirring batters to mixing vegetables. The paddle itself is a little small but overall a handy utensil! This Mercer 11 7/8" white high temp spootensil is a nice tool for cooking ground meats. It is sturdy enough to break up the meat while it is cooking. Cheap, light, easy to use, and high temp means you can use it for just about everything. It'll become the first thing you reach for when cooking! I ordered this on a whim - it is inexpensive, and I am tired of fussing with wooden spoons. I love it - I will definitely be ordering it in the other sizes. Went though the dishwasher with no issues, does not flex in moderately demanding situations. I don't typically have difficult stirring jobs, so not sure what it's maximum capability is, but it certainly suits my needs. I wish it came in different colors, but the white is certainly acceptable. Great for combining items with sugar. We use it to candy nuts or to mix fondant while on a bane. Great price, got more than i should of. These heat resistant plastic utensils are fabulous. I have them in several sizes and they really do withstand heat without melting. Use them anywhere you would use a wooden spoon. What a wonderful stirring tool! This is the stirring spoon that gets grabbed first. Its easy to use and easy to clean and affordable to buy. Our next order will have at least one on it. It's the tool I keep reaching for most. I end up defaulting to this, particularly when making anything involving hot sugar or other potentially scalding items. I don't worry about handle heat or residual mess. Just came across this while on the site, decided to try it. The product seems to be good enough. I was hoping that it would do a good job kind of scraping the sides as well as being used to stir. It definitely does not do as good a job cleaning the sides as a spatula. To be honest, I bought the product blindly and cannot fault it for not doing what I hoped it would do. I do not think I would buy this product again. However, I do not regret buying it and have been using it for cooking. 4 out of 5 mostly because I just don't love the product. We use these as blender scrapers. We went with these over softer rubber spatulas because there is less chance of chipping. They are work horses and we're very happy with how they've held up. I love this tool! Sometimes a spoon is not the right utensil, and a spatula won't do the job. This is perfect for those occasions. It cleans up well and has not stained, even after use to stir strongly colored sauces. It goes fine through the dishwasher. I just ordered more. This spootensil, as they call it, is a handy kitchen tool to have around. It's sturdy and doesn't melt even in boiling liquid. Even though it's a funny shape, it's one of the most convenient kitchen tools. When we purchased our first spoontensil, we were not quite sure what we were buying but now we are in love. A heavy plastic version of the old fashioned wooden spoon. The small one is great for using in mixing bowls. This utensil is awesome for use in our double boilers for stirring the melted chocolate. Very durable and stiff even when sitting in hot liquids for long periods of time. 5 stars. Essential tool in the kitchen. Great for doing candying work, cleans off well, can use in high temperatures. Great to hang up in the kitchen! I found this while "shopping around" on your website. I never owned one and after reading the reviews decided I would try it. I am glad I did. I use it all the time to dip and spread my mayo on sandwiches. I used to use a regular spoon but I left quite a bit of mayo in the spoon. This is great. The mercer line of products is excellent we have started using them in our home recently. This spoontensil is no different it has exceeded my expectations. Finally a tool that can reach deep inside a gallon container of mayo or mustard. I am a food cost animal and I can get every bit of product out with this tool. I had no idea what a spootensil was. I was curious so I bought it and it turns out I love it lol. I'll be buying more. The spoontensil work well, it will stain however if using it in food such as tomato sauce. If you don't mind it staining, it will be fine to use. We have purchased a couple of these and they have held up well. Great quality spoontensil. Wasn't exactly sure what a spoontensil was, but am glad I bought one. Great for stirring liquids and sauces in deep pans, and can hang from a hook for easy use and storage! It gets the job done well and you can't beat the price. This is a must have for any kitchen to replace wooden utensils when cooking. Despite the clever name, this is just a stirrer. Its curvature works brilliantly with my 3-quart saucier. It is completely rigid, and works brilliantly for stirring thick sauces. It is stain-resistant, but is not stain-proof (tomato sauce will stain it). I discovered last night that it also works brilliantly as a rice paddle. The price makes this an unbeatable addition to your kitchen. I bought this item having no idea what a "spoontensil" was supposed to be used for. I used it instead of a wooden spoon to stir cranberry sauce and tomato sauce hoping that it wouldn't stain quite as badly as wooden spoons. It still stains a bit, but otherwise is fine. Mercer M35121 White High Temperature Spootensil - 11 7/8". I have switched from wooden spoons to this utensil. It does absorb strong colors, but it is perfect for use on my non-stick pans. This 11 7/8” White High Temperature Spootensil is the best. When I had used this spoon now I refuse to go back to the wooden spoon. This spoon doesn’t stain like the wooden spoon and make stirring sauce smoother. I had purchase 13 ¾” spootensil as well. These spoon are awesome will purchase different sizes again. This spootensil (flat paddle) is a great addition to any kitchen. Won't scratch your non-stick coated pans. It's long handle makes it easy to use with deep pots. And much easier to clean than wooden utensils. Love this spoon! Great for stirring sauces without scratching nonstick pans, cleans up nicely in the dishwasher. Will buy in multiple sizes and give as gifts. This is now my go to mixing device. I use it for everything from mixing frosting to cake batters. I will be purchasing more of them. This is a great alternative for wooden cooking spoons!! It is comfortable to hold while stirring sauces or batters!! I like how easy it is to hang on a hook!!! !